Twentieth-century predictions that black holes might exist naturally raised the question of how such superdense objects could form. Over time, scientists came to realize that there might be more than one answer to this question, depending on the size of the black hole. Ever since the days of Michell and Laplace, astronomers and physicists had focused their attention on star-sized objects with extreme gravity. So the quest to understand how such bodies form concentrated on the life cycles of and physical processes within stars. However, the mathematical equations of Einstein's general theory of relativity allow for the existence of black holes of any size, including very small ones. After John Wheeler coined the term black hole in 1967, a number of scientists began theorizing about miniature black holes. A mini–black hole might be the size of an atom. Yet its matter would be so densely compacted that it would weigh something like 100 trillion tons! An even tinier black hole—say the size of an atom's nucleus—would still tip the scales at about a billion tons. 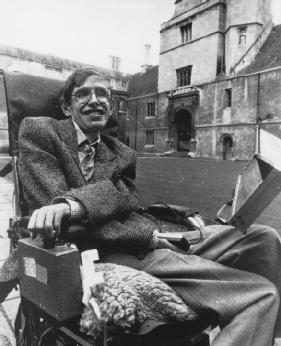 Stephen Hawking proposed that microscopic black holes formed in the huge explosion that gave birth to the universe . The channel cut through a planet by a mini–black hole would be so small and narrow that it would be far less noticeable or consequential than a tunnel dug through a garden by an ant. If mini–black holes do exist, therefore, their physical effects on large bodies are minimal and they are of little concern to human beings and any other living beings inhabiting the universe. By contrast, black holes of stellar and larger masses have far more important potential consequences for the universe and life. And this is why scientists have devoted so much time and effort in recent years to understanding how they form, as well as their properties. They realized that it would require a tremendously violent process or event to compress such gigantic quantities of matter into an extremely small space. Moreover, the energy produced would have to be millions of times larger than in those events people normally deem catastrophic—including earthquakes, volcanic eruptions, and the crash of asteroids onto planetary surfaces. It became clear to scientists that only the phenomenally violent death of a large star could account for the creation of a stellar black hole. Understanding how stars die and create superdense bodies requires some basic knowledge of how stars live. In the same way that people undergo an inevitable life cycle, stars are born, live out their lives, and finally die. The nursery of a typical star, including one like the Sun, is an extremely large cloud of gases and dust floating through space. Such clouds come into being when "winds" created by exploding stars blow scattered molecules of gas and particles of dust around; some become even more scattered, while others become more concentrated. When such a cloud becomes concentrated enough, gravity causes it to contract still further over time. This contraction also produces heat, which makes the gases and dust grow steadily hotter. Soon, the center of the cloud becomes hot enough to cook a steak; then it reaches the temperature of a blast furnace; and finally, after a few million years, the temperature at the cloud's core becomes hot enough to fuse hydrogen atoms and thereby ignite nuclear reactions. At that instant, the core emits a huge burst of blinding light and other energy that blows away the cooler outer layers of the cloud, leaving behind a giant ball of white-hot gases—a newborn star. The new star has enough hydrogen in its interior to keep its self-sustaining nuclear reactions going for billions of years. And throughout this longest portion of its life cycle, it continues producing light and heat. If certain other factors in the star's solar system are favorable—such as the formation of a planet at the right distance from the star and the presence of water—this abundant light and heat makes the rise of life possible in that solar system. No significant danger is posed to such life as long as the star remains stable. Thanks to this balance between outward and inward pressures, stars like the Sun maintain their structures and remain stable for long periods of time. Astronomers estimate that the Sun, which has been in this stable state for several billion years, will remain in it for several billion years to come. Like an animal or a person, however, the great luminous ball cannot live forever. Eventually, a star must use up all of its fuel and enter its death throes, producing a catastrophe in which most of its matter is forced into an extremely dense state. This state can take one of three different forms, depending on the star's initial mass; in each case, a superdense object is created. Two of these objects—a white dwarf and a neutron star—are in a sense immediate precursors of and steps on the road to the black hole. The third is the black hole itself. The Sun is destined to be transformed into the first of the three superdense bodies created when a star dies, a white dwarf. Billions of years from now, our star will begin to run out of the hydrogen that fuels the nuclear reactions in its core. When most of the hydrogen is gone, the core will get both denser and hotter. This extra heat will cause the Sun's outer layers to expand outward, transforming it into an enormous star hundreds of times bigger than it is now; in fact, its surface will engulf the orbits of Mercury and Venus, destroying those planets, and the surface of Earth (which will then be the innermost planet in the solar system) will be scorched as if in a blast furnace. However, because the Sun's new surface will be stretched and more spread out than before, any given portion of it will be a bit cooler. So the star's color will change from a hot yellow to a cooler red. For this reason such expanded, cooler stars are called red giants. Once formed by stellar collapse, solitary white dwarfs slowly cool and fade from view. 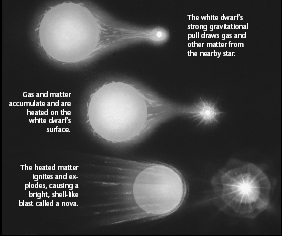 If they are part of binary (double-star) systems, however, white dwarfs can periodically produce explosions called novas, as explained here by University of Amherst astronomer Thomas T. Arny in his noted astronomy text Explorations . If a white dwarf has a nearby companion, gas expelled from the companion may fall onto the dwarf…. Coming from the companion's outer layers, such gas is rich in hydrogen and may briefly replenish the white dwarf's fuel supply. The new fuel forms a layer on the white dwarf's surface, where gravity compresses and heats it. The gas layer eventually reaches the ignition temperature for hydrogen, but … nuclear burning in a degenerate gas can be explosive. The detonating hydrogen is blasted into space and forms an expanding shell of hot gas … that radiates far more energy than the white dwarf itself. Sometimes these stellar explosions are visible to the naked eye. When earlier astronomers saw such events, they called them novas, from the Latin word for "new," because the explosion would make a bright point of light appear in the sky where no star was previously visible. Astronomers have determined that the ultimate fate of average-sized stars—those having up to 1.4 times the mass of the Sun (or 1.4 solar masses)—is to become white dwarfs. But what about stars that start out with more than 1.4 solar masses? They obviously have stronger gravities. So it is only logical that their end will be more violent and result in the formation of an object even more dense than a white dwarf. Because such an object is made up almost entirely of neutrons (forming a substance many scientists call neutronium), it is called a neutron star. The bright object at the center of the Crab Nebula is the pulsar discovered in 1968. Such objects are actually neutron stars . The rest of the star's original mass is now concentrated in a ball of neutronium about ten to twenty miles across, roughly the size of a large city. So dense is the material in a neutron star that a tablespoon of it weighs at least several trillion tons. Furthermore, such a star's escape velocity is nearly 125,000 miles per second, about two-thirds the speed of light. All of this sounds convincing in theory. But astronomers had no direct proof of the existence of neutron stars until the late 1960s, when objects called pulsars began to be found. 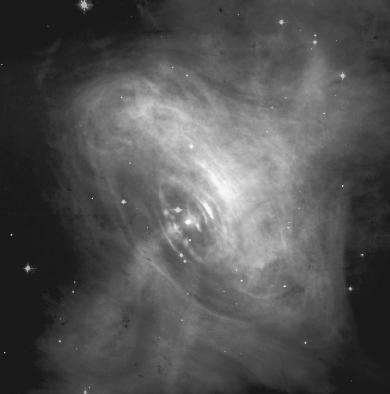 In 1968, for example, astronomers discovered a strange object at the center of the Crab Nebula. Located in the constellation of Taurus, the bull, this bright, rapidly expanding cloud of gases is the remnant of a supernova that occurred in 1054 and was recorded by Chinese and Japanese observers. Modern astronomers noted that the object at the center of the nebula gives off regular, intense bursts, or pulses, of radiation at the rate of thirty per second. Appropriately, they named this and other similar objects pulsars. Neutron stars have enormous gravity, which would cause a living creature to be crushed out of existence in a fraction of a second, as explained by the great science explainer Isaac Asimov in his book The Collapsing Universe . Suppose that an object with the mass of the sun collapses to the neutron-star stage and is only 14 kilometers [8.7 miles] in diameter. An object on its surface will now be only 1/100,000 the distance to its center as it would be if it were on the surface of the sun. The tidal effect on the neutron star's surface is therefore 100,000 × 100,000 × 100,000 times that on the sun's surface, or a million billion times that on the sun's surface and a quarter of a million billion times that on the Earth's surface. A two-meter-tall human being standing on a neutron star and immune to its radiation, heat, or total gravity would nevertheless be stretched apart by a force of 18 billion kilograms in the direction toward and away from the neutron star's center, and of course the human being, or anything else, would fly apart into dust-sized particles. Scientists now know that neutron stars like the one in the Crab Nebula are not the last word, so to speak, in the awesome story of stellar collapse. That distinction belongs to the black hole. Light is just barely able to escape the deep gravity well of a neutron star, so in a sense it almost qualifies for black hole status. In fact, says John Gribbin, "A neutron star sits on the very threshold of being a black hole." 21 One major factor that sets black holes apart from neutron stars, however, is that no light can escape from a black hole; light and everything else that gets too close to a black hole becomes trapped inside its gravity well forever. A stellar black hole forms from the collapse of a star having more than eight times the mass of the Sun. So powerful is the force of the inrushing matter that it bypasses both the white dwarf and neutron star stages and compresses that matter into an even denser state. In fact, the matter keeps on falling down the star's gravity well in a sort of neverending death spiral. This is because the gravity well of a black hole is like a bottomless pit, from which nothing can escape. Not surprisingly, this densest of superdense objects jams an extremely large amount of material into a very small volume of space. A stellar black hole is surprisingly small, therefore. One formed during the death of a star having eight solar masses would probably be only about the size of a small house. It is important to remember that most of the former star's original matter is still inside the black hole. (Some of its matter was ejected into space during the supernova accompanying the star's collapse.) That means that the object's gravitational pull will be roughly the same as that of the original star. Any planets orbiting the star before its collapse would continue orbiting the black hole, which would not capture and consume them unless they strayed too close to it. The survival of a planet and the survival of living things that might inhabit it are two different things, however. A majority of life forms that happen to exist on planets orbiting a star that becomes a black hole will die from powerful radiation released during the catastrophic collapse and supernova. And any life that has the misfortune to survive this disaster will quickly freeze to death after the star stops radiating light and heat. Clearly, the formation of a stellar black hole is one of the most awesome and potentially lethal events that can occur in nature. what will happen when one black hole comes in the field of other ie within the schwarzchild radius of both?